Gillian Hughes, a volunteer with Morton in the Community delivering Football Fans in Training, is a Senior Active Schools Coordinator with Inverclyde Council and sees our work and impact on a daily basis. Gillian comments: “It’s great that Morton in the Community covers so many programmes in addition to football, this really creates a community focus. The variety of the programmes on offer is truly amazing and is a reflection of the hard work put in by all staff and volunteers. Fundraisers have the option to choose a second charity to split the funds with. However, Gillian has generously committed all funds she raises to Morton in the Community. You can support Gillian’s #Morton50DayChallenge by donating to her Just Giving page by clicking here. 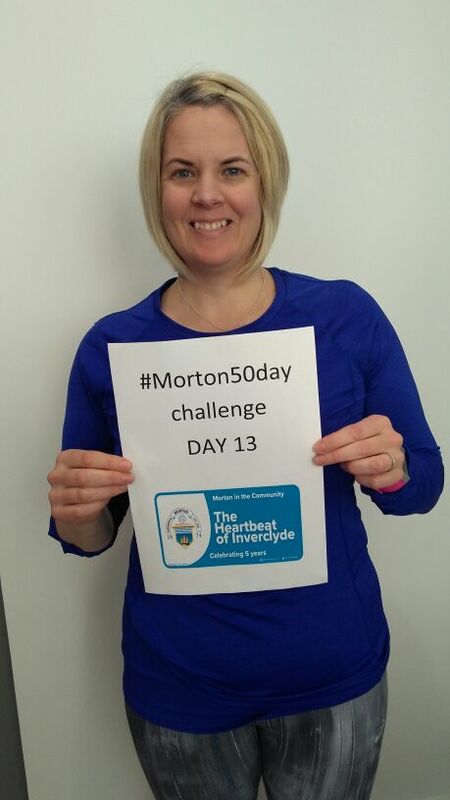 The #Morton50DayChallenge encourages fundraisers to get active while fundraising for Morton in the Community and causes close to their hearts. Fundraisers are encouraged to walk, swim, jog or cycle 5k a day for five of seven days per week for fifty days. For more information click here.